Sandboxing support for App Store build. Completely redesigned how we interact with iTunes on Mac. This will provide a much better, and bug-free, experience. Moved Power options for non-sandboxed version to a Power tab. Fixed crash on Windows bug reporter. Fixed major issue on Windows that would make menu items disappear. Now uses CURL to send e-mail as our existing solution was broken. Next story Wondershare Recoverit 7.1.1.4 – Comprehensive data recovery suite. Previous story Receipts 1.7.4 – Smart document collection. Alarm Clock Pro 9.4.6 – Let your computer wake you. 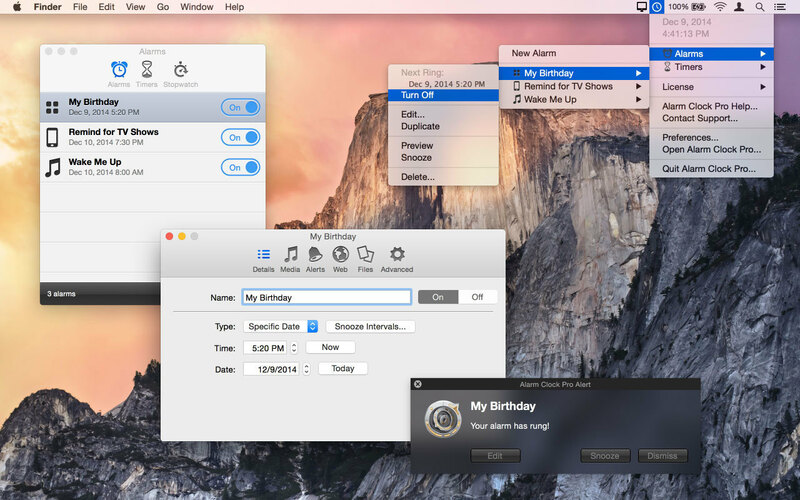 Alarm Clock Pro 10.2 – Multi-featured alarm clock system.